Synopsis: Retired Colonel Ray Longknife and Marine Captain Terrence « Trouble » Tordon come to Savannah via different routes, but what they find is the same. One bully strongman is intent on keeping power no matter what the new rules are for peace. He’s got the population cowered by thugs, and tanks at the ready. He expects to win the coming elections handily. He doesn’t expect trouble. Or, in this case, Mrs. Trouble—aka Ruth Tordon—a Marine wife on a mission to find the drug lords that almost killed her and her husband and put them out of business—and she’s not about to be stopped by some barely trained roughnecks. Abandoned by their strongman and desperate in defeat, the heavy armor get ready to roll into town over anybody in their way. But Ray Longknife, Trouble and Ruth are standing in their way…and nothing is going to flatten them. Review: Firstly I must say that I did not know anything about the series and when I saw the cover I was not convinced that it would be for me. Besides the synopsis confirmed me this fact… science fiction, other planets, marines, and many things I don’t really like but yet I was very surprised to see that I had a great time with this novel and it also made me really want to try the others in the series. Yes, because as always I start my story here with Volume 4, but do not worry right now, I really had no problems and the author manages to do everything perfectly so we understand from the outset that we can follow the chapters without worries. Throughout the novel, we follow a lot of people but who move together in the same environment. I always have a little trouble with too many POVs, but it’s really not the case here, perhaps because it is very often on the same 2-3 people. In addition, the chapters are often very short too, which definitely helps the reading and makes us want to continue to learn more. Early in the book, we focus specifically on two characters, Ruth, the wife of a Marine who is determined to help him discovering who are the manufacturers of the drugs on a planet and Ray, a colonel who left his wife for a diplomatic mission on the same planet. It is quite difficult to see how the two stories will meet, but through the chapters, we understand where the author wants to lead us. I took great pleasure in discovering this story, to understand what the characters were trying to do to bring down the dictator. It must be said also that all the actors are really important and interesting whether Ruth and her husband, or Colonel Mary, a navy woman who helps her but also all the orphans of this planet with whom Ruth binds friendship and who will be of crucial help to reach their goals. So many characters but all more interesting than the others. But while their research is long and tedious, the resolution of their case will be really far from being as easy as they might think. However, our group faces all that and I took a great pleasure in discovering Ruth with her kindness, her generosity but also her determination and her will. We have many things here, of course, we also have a few reminders of other volumes and it is true that I would love to attend and read the encounter between the young woman and her husband but I think it will be for later. As I said at the beginning, we can read the novel very quickly and I took a great pleasure to see it all, whether it’s about the characters or the plot and I’m now curious to learn more. By trying something different, I’m glad to say that I had a great time and I was eager to see how it would be resolved. The author presents here a very nice mix of conspiracy, science fiction and characters who particularly affect us. To read! This entry was posted in Mike Shepherd, Science Fiction, Society of Humanity. Bookmark the permalink. Sounds interesting. I love the cover with the gun. She looks ready to go! I was mixed by the cover but it’s good! Actually, science fiction, other planets, marines etc. are exactly the things I like, so if you ended up enjoying this despite them, I’m sure I will too! I’ve never seen it before but it sounds fabulous. yes it is I think you’ll definitely enjoy it! Just from the cover I know this is my kind of book. lol. Great review. At last it’s fast for you. yes he did, I was surprised. Yes for once it was ok. They didn’t ask me but it was a good surprise. Yes it’s difficult to know without trying sometimes. Yes everything was ok for me with it. I understand, I’m not either. Was this really sci fi and high fantasy? I seem to struggle with those for whatever reason. n just basic sci-fi, nothing complicated. Yes it’s a nice feeling I agree. That’s great you’re so willing to read things that are different. It’s fun to find yourself surprised by a book!! it’s always nice to change from time to time. I have this on my TBR pile. I have read the books that come after this one and enjoyed them. You make me want to read this one now instead of later. I hope you’ll like it too! I’m used to reading books that feature chicks with swords on the cover, but I’m diggin’ Ruth’s look. The fact that you enjoyed this one even though it’s not your typical go-to genre bodes well for me too. I »m glad if you want to try as well. It does sound so cooL! That is a badass cover! I’m digging the cover. Glad this one was a winner. 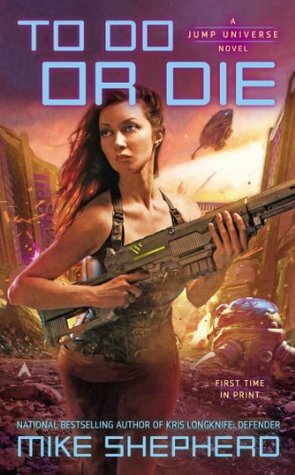 I’m not really a big reader of science fiction, but you got me quite intrigued with this one, Melliane… Happy it worked so well for you! I love it when books surprise you in a good way! And that you could jump right in even though it is the fourth book. Sounds like a fun read. Ha! I can see why you were compelled to read it 😉 I’m glad you liked the characters and found the pacing to be good!